Unfortunately, some musical efforts were bound to fall and nothing could be done to prevent it, even years after the first break, can hold the rock steady. The band OVERLORD from Canada is a good exemplar of such a breakup. With a series of official and unofficial releases that ranged through nine years, the band didn't claim a rightful place in the Metal world. After listening to the new compilation, named "Back Into The Dragon's Lair", made for the band by Heaven And Hell Records, after it was once released independently in 2003, I can truly see why the ship cracked after all. The "Back Into The Dragon's Lair" combo was assembled from the band's debut EP, the only official release, and a range of demos between 1988-1993. The tracks were lined up chronologically in order to let the listener feel the changes that went on the band's musical approaches, from NWOBHM al'a old IRON MAIDEN and 70's oriented Metal of JUDAS PRIEST to Traditional Heavy Metal mixed with several weird affiliations. Before entering to details, the overall road of OVERLORD started with good intentions and a strong potential, however, as the years went by, all their efforts were succumbed to boredom. 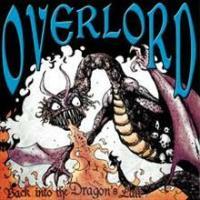 In first tracks, meaning the self-titled EP, "Overlord", the band show great promise as a NWOBHM band. Tracks as "X-Rated Man" and "Distant Orphan" come as great melodic Metal figures with great vocals by the band's part-time ex-vocalist, Colin Wilkinson and solid guitar works. The next track after the EP, from the demo "Full Force", "Walk Softly" is also a charmer; however it is the last track with Wilkinson on vocals. Subsequent to those tracks, darkness loomed on the OVERLORD.The coming songs from the demos "Into The Dragon's Lair", "Nice Life" and "The Open Eye", will probably change the opinions regarding the past prospects. With the change of the vocalist to Jim Feeney, came the change of sound along with the musical approach. From all of those of tracks only "Midnite Fight" came to be somewhat impressive. Other tracks came to be boring or repetitive. Even while trying to infuse new elements to the music such as on the track "Subterranean Spiral Dance" that resembles very much to the "Planet Caravan" of BLACK SABBATH, didn't make the cut on being a solid track. Moreover, the final track of the compilation should have been inserted as its recording quality couldn't have been upgraded to a suitable track. To summarize, "Back Into The Dragon's Lair" came out to make synopsis of a band's career, which had a chance of starting over, yet fell apart in the end. It began good and ended bad. It's interesting if there will be another attempt in the future.